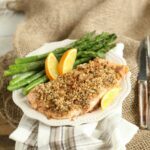 Maple Pecan Crusted Salmon is a wonderful healthy inspired recipe featuring chopped pecans and granulated maple sugar. Healthy eating never tasted so good! Are you trying to eat healthier but still want your meals to be packed with wonderful flavor? 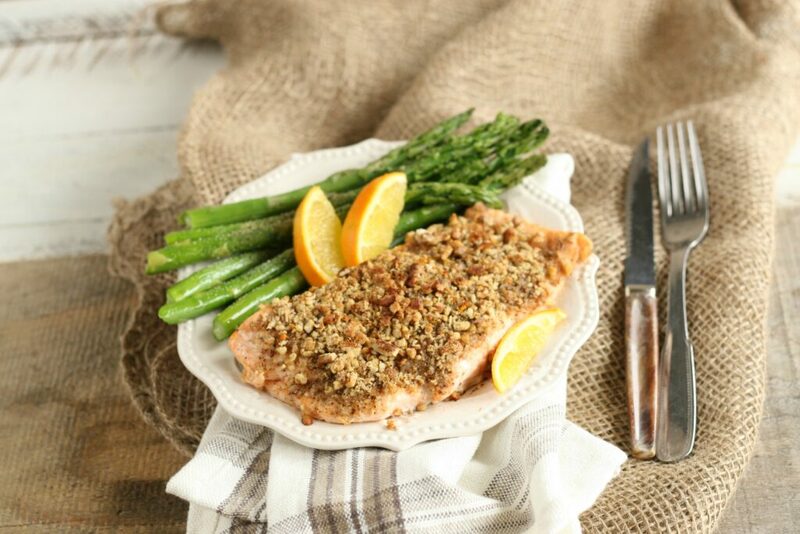 Then you’ll definitely want to try Maple Pecan Crusted Salmon. This recipe is so simple to make. Simply make a pecan coating and rub it on the top of a few salmon filets. Granulated Maple Sugar is the granulated form of pure maple syrup. Find it at sugar houses’ and farms in New England . Otherwise find it on Amazon. Substitute granulated maple sugar for equal parts in any recipe that calls for granulated sugar. It gives you a touch of maple taste and is a raw sugar. 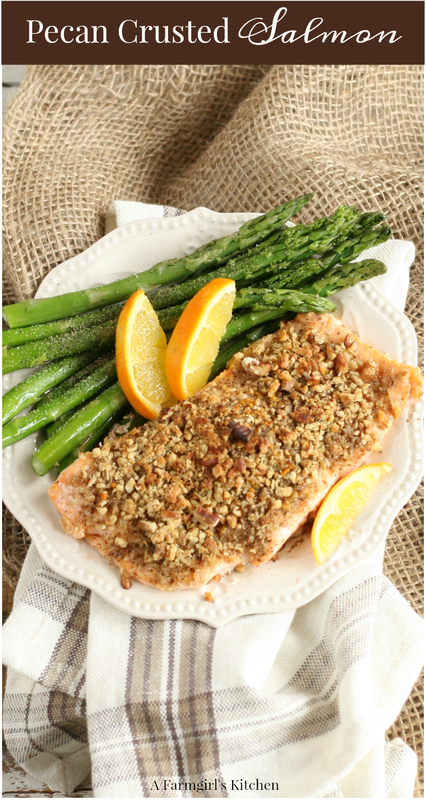 Simply place the maple pecan coating on the top of the salmon filet and bake in the oven. Or you could place this salmon on a cedar board on the grill. That would be perfect for summer dinners! 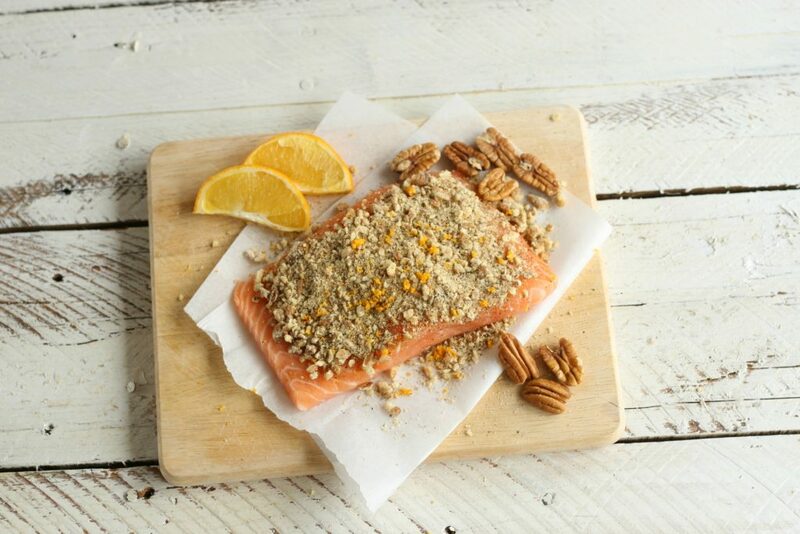 Maple and pecans make an amazing coating on this delicious salmon recipe. Perfect for eating healthy but still wanting plenty of wonderful flavor! 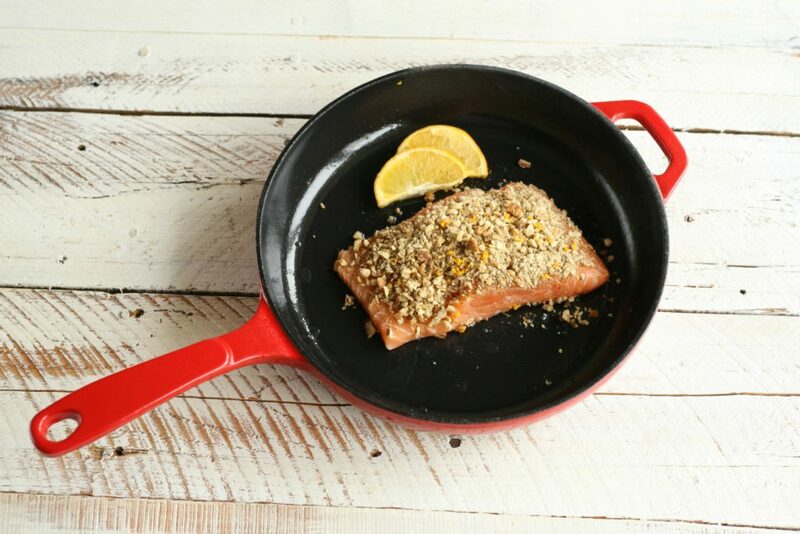 Spray a cast iron pan with cooking spray. Set aside. In a small bowl, combine the chopped pecans, maple sugar, ground mustard, onion powder, garlic powder, paprika, salt and pepper. Press on the top of each salmon filet. Place the fillets in the pan. Cook in a preheated 375 degree F oven for about 20-22 minutes, or until thoroughly cooked. Enjoy with seasonal vegetables and rice. This recipe looks really awesome. I am sharing this with my friend who eats salmon. She would love to try this. I like making nut crusted fish. This looks like a simple and flavor balanced meal. What a perfect meal for any night of the week. I love the pecan crusted topping and maple sugar for a slightly sweet topping. Can’t wait to make this for dinner soon! Perfect dinner tonight. I love that this salmon is coated with crunchiness and full of flavors. Yummers! 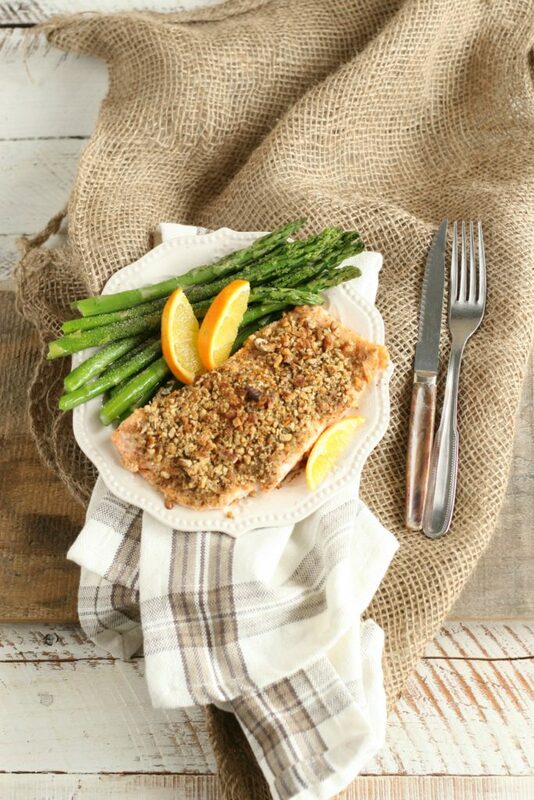 Wow, these MAPLE PECAN CRUSTED SALMON are so cute! I would love to eat this for breakfast, lunch and dinner! Thank you for sharing this great recipe!